Damaged is the eighth book in bestselling Alex Kava 's series featuring FBI profiler Maggie O'Dell. 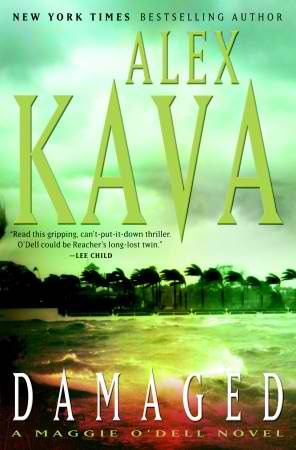 One of the shortest novels by Kava to date, Damaged opens off the coast of Pensacola, Florida, where a water-rescue team is retrieving a mysterious cooler found to be filled with random body parts wrapped in cellophane. Maggie O'Dell is called to the scene to investigate despite a powerful hurricane approaching the Gulf coast faster by the hour. Investigating his own isolated case just a short distance away, Maggie's boyfriend Benjamin Platt is looking into a potential deadly virus that is wiping out a large number of soldiers home from Iraq. Could the two cases be related? Rivaling the styles of Jeffery Deaver and Lee Child , Alex Kava manages to pack a great punch into her novels with suspense that keeps you hanging on all the way through to the end. Her novels are extremely entertaining with somewhat transparent red herrings, but the story is so cleverly put together that you won't even care. Considering Damaged is the eighth book in the series, readers who have followed Maggie O'Dell throughout each novel will appreciate Kava's reminders of Maggie's past experiences that have shaped who she is as a person both emotionally and professionally. Readers looking for a quick, fast-paced escape into the world of FBI investigations and good guys versus bad guys will find Damaged definitely fulfilling that need. The next Maggie O'Dell book to be released is called Hotwire , set to release in July 2011. Have you read any books by Alex Kava -- if so, what is your favorite?